The Washington State clinic comments on a recent article that, while there are many causes of varicose and spider veins, there are also numerous solutions. 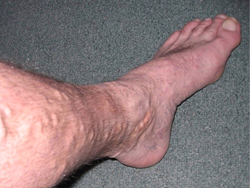 Male and female patients alike often suffer from various types of enlarged veins. Very fortunately, there are a number of treatments that deal with unsightly, and often painful and medically significant, enlarged veins. A July 7th article on Bustle describes 11 “surprising habits” that may sometimes lead to, or worsen, varicose veins in some patients, according to medical experts. Washington State medical clinic Northwest Vein & Aesthetic Center notes that, while avoiding certain not-so-good practices, like excessive sitting or standing, or regularly nicking yourself while shaving your legs, and taking up such good habits as building up leg muscles with regular, low-impact exercise can definitely help to slow the spread of enlarged veins, varicose and smaller spider veins will still arise in some patients due to such factors as genetics and age. The center points out that, very fortunately, there are a number of treatments that deal with unsightly, and often painful and medically significant, enlarged veins. Northwest Vein & Aesthetic Center notes that, in the past, the surgery commonly referred to as vein stripping was the primary medical intervention for the treatment of varicose veins. However, the clinic notes that this procedure has mostly been replaced by a number of highly effective minimally invasive treatments that are helping thousands of patients. These treatments include Varithena, a non-surgical, injection based intervention which can be highly effective for patients with problems in the great saphenous vein (GSV) region. The clinic notes, however, that other patients may benefit more from Venefit, a technique that harnesses the power of radiofrequencies emitted through a catheter to close off and seal veins. In other cases, endovenous laser treatment (EVLT) uses highly focused heat to close off veins. A newer solution, known under the brand name of Venaseal, employs tiny amounts of a medical adhesive to close off veins via a catheter. There are also a number of innovations in terms of making patients more comfortable, adds Northwest Vein & Aesthetic Center. The clinic says that, in addition to dramatically reducing the level of discomfort through minimally invasive procedures, there has also been progress in terms of helping patients to relax while procedures are performed using local anesthetic and light sedation. Specifically, the center points to its use of Virtual Reality Anxiety Reduction Technology (VR), which has been shown to greatly reduce not only stress, but also the perception of discomfort, by providing a patient with a fully immersive environment produced via state-of-the-art audio-visual technology. Readers who would like to learn more about what Northwest Vein & Aesthetic Center can do for patients dealing with enlarged veins and other issues are invited to call (253) 948-4378. They can also visit the center online at http://nwveins.com/. The public can take advantage of the clinic at its two Washington state locations in Olympia and Gig Harbor.